BACK ROW: Rich Moll, Ed Habza, Tom Bailey, Mike Callan, Glen Barnard. 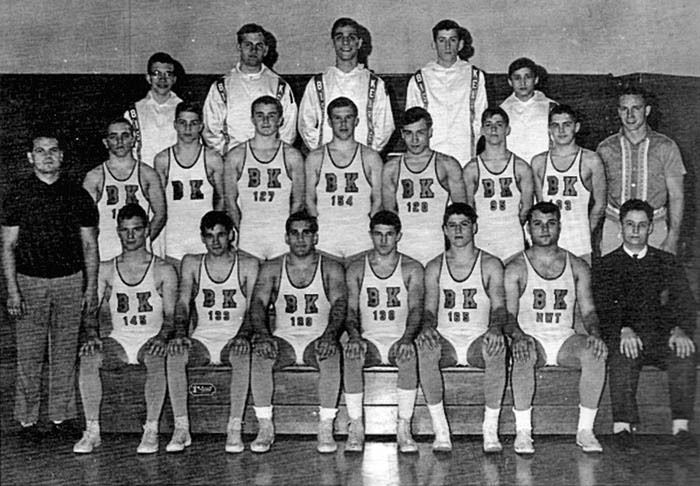 MIDDLE ROW: Tom Ciaccio, Gene Oberst, Greg Brown, Al Ozminkowski, Art Rogers, Rich Palmer, Pat Walsch, Terry Mather (head coach). FRONT ROW: Ron Rucker (asst. coach), Dan Oberst, Pete Scott, Don Vella, Phil Dollard, John Numetko, Tony Joy, Tom Garney (manager). "The mark of a great team is its ability to bounce back after heartbreaking disappointment. The BK varsity wrestling team has proved its greatness. Having won its first seven meets, the team suffered two close defeats, shattering hopes for an undefeated season. Undaunted by these setbacks, the Kings rebounded in their final three matches, taking victories with the cumulative total of 118-12! Any doubts about BK's superiority over other area teams were dispelled at the Eastridge Christmas Tournament. Here the Kings took tourney honors as the edged out seven other squads, including the host team and Madison, county and city champs, respectively. The grapplers further attested to their prowess as they garnered the New York State Catholic Championship, beating their nearest rival by almost fifty points. The only tournament letdown came in the Leo Tournament in Chicago, where the matmen had to settle for a second place finish. Nonetheless, it was a strong second, considering the caliber of the opposition, which came from many parts of the country. In dual matches, BK added to this great record by defeating such local powers as Eastridge, Irondequoit, Franklin, and McQuaid. There were, unfortunately, two losses ―― one to Ithaca, the other to East Rochester, but valid excuses can be presented in the defense of the team's showings. Adverse weather conditions prevented practicing for a week, and a key performer was injured. Head Coach Terry Mather offers no alibis, however, most likely because he can look forward to next year's bright prospects, when he will have eight returning starters, besides members of a junior varsity team which posted a record of 12-2."